Concept art of the two companies vision. Robert Bosch and Daimler are partnering to develop a system that will enable a self-driving taxi service by the start of the next decade. 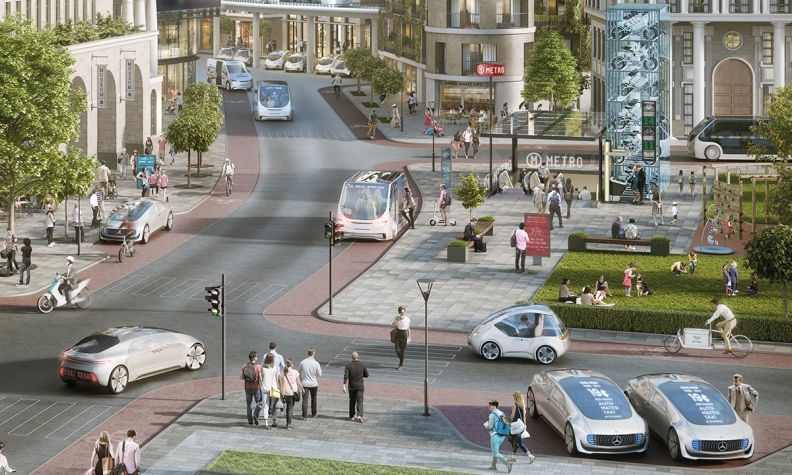 The companies will collaborate on autonomous software with the goal of operating Level 4 -- which requires no human intervention in defined situations -- and Level 5 -- which is completely driverless -- autonomous vehicles in urban areas, Bosch said on Tuesday. The envisioned service will allow customers to order self-driving taxis on their mobile phones within a predetermined area. A spokesman for Bosch declined to give further details on the rollout of the technology. Daimler has already been working on entering the autonomous ride-hailing space. In January, the automaker said it would supply self-driving Mercedes-Benz cars to Uber, though Daimler said it would develop the technology on its own. Bosch has also been teaming up with companies in the pursuit of autonomous vehicles. In March, the supplier said it was working with chipmaker Nvidia to develop a supercomputer to power a self-driving system.